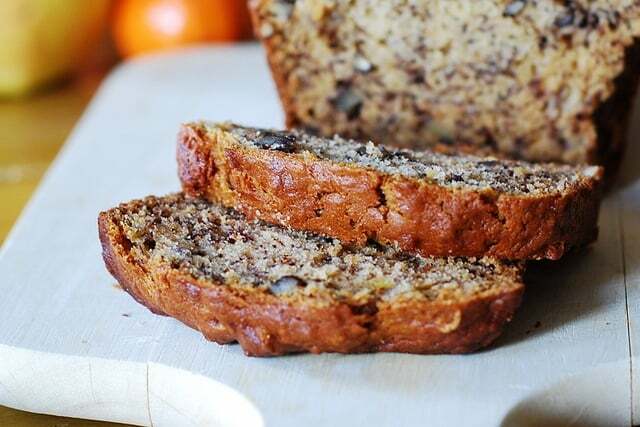 Banana bread with walnuts – perfect breakfast and dessert recipe! 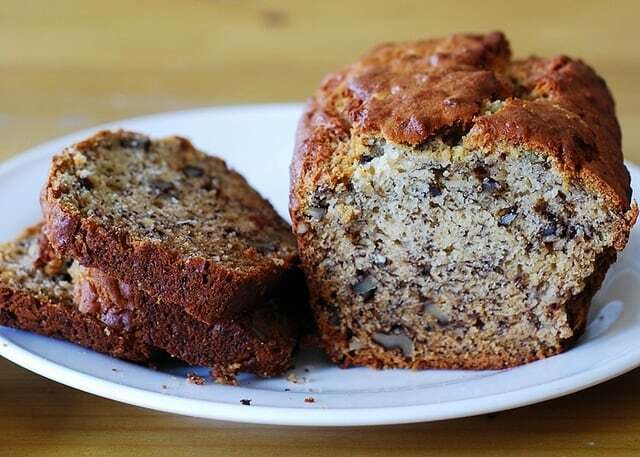 This is simply the best recipe I’ve found so far for the most moist, perfectly sweetened, and easy banana bread. 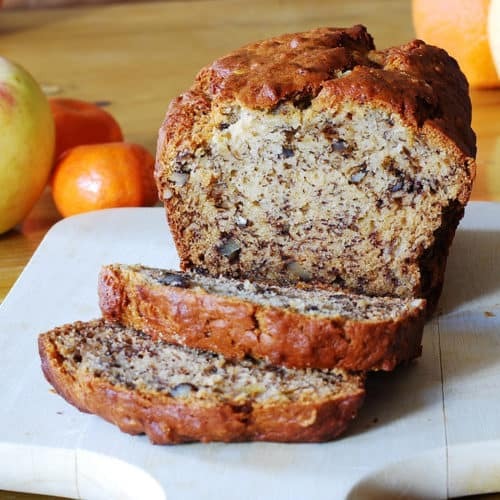 I added walnuts to this recipe, but they are totally optional, even though I love my banana bread with walnuts. This recipe is so easy, you don’t even need a mixer – just mix everything with a big wooden spoon! 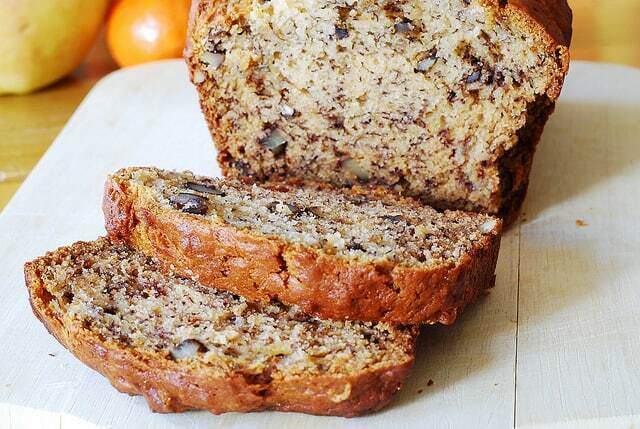 I’ve been eating this walnut banana bread for both breakfast and dessert for the past week and just love it! 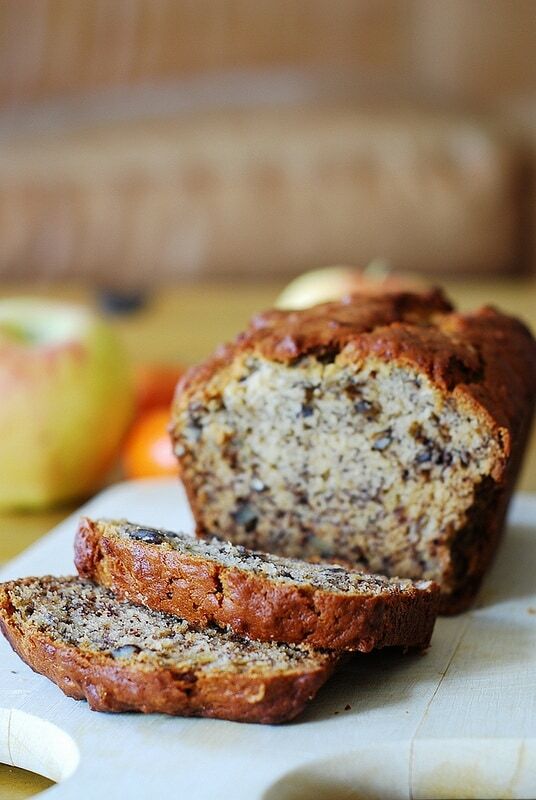 Try this delicious banana bread with walnuts and you’ll love it as much as I do! 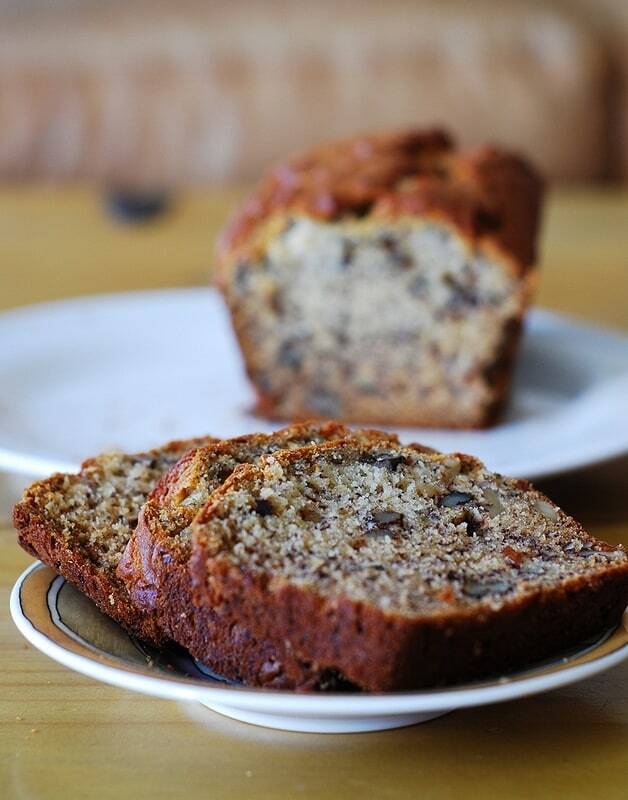 This is simply the best recipe for the most moist, perfectly sweetened, and easy banana bread. I added walnuts to this recipe, but they are totally optional. This recipe is so easy, you don’t even need a mixer – just mix everything with a big wooden spoon! In a large bowl, mix butter into the mashed bananas, using wooden spoon. Mix in the sugar, egg, and vanilla. Sprinkle the baking soda and salt over the mixture and mix in. Add the flour last, mix just enough to blend the ingredients; do not over0mix, the lumps will work themselves out. Add chopped walnuts to the batter and mix them in to distribute evenly through the batter. Butter a 4×8 inch loaf pan. Line the bottom of the pan with parchment paper, butter the parchment paper too. Pour the batter in the pan. Bake for 1 hour. Cool on a rack. Remove from pan and slice to serve. Note: lining the bottom of the pan with parchment paper ensures that the bottom of the bread will not get stuck. I love this recipe! The only thing I do differently is grind up old fashion oats and use this instead of flour. So glad you liked this recipe! Thank you for your comment! You are very welcome! So glad you enjoyed this banana bread. The addition of cinnamon sounds delicious! I did a Google search for Best Banana bread and out of the options choose to try your recipe. I have enjoyed the past two mornings with my cup of coffee, just delicious! This will now be my go to recipe and I am enjoying checking out more of your blog. Thanks! Thank you so much for such a kind comment! I am so happy you chose my recipe! So glad you liked it! I also made this banana bread with blueberries – here is the recipe: Blueberry Banana Bread. I’m (or my kids rather) are in LOVE with this recipe!! Have been using it for about a year now. I have never made a loaf; I always make muffins out of it. Easier for the kids to grab. I sometimes add pumpkin pie spice. Thank you! Laura, you are very welcome! So glad you’ve been making this recipe! Great idea to bake this bread in a muffin pan. I am going to try this recipe later today. It sounds delicious and so easy. I don’t have parchment paper at home, so I hope that greasing the pan will be sufficient. Yes, bake longer if the center is wet. All ovens are different, and some ovens might take longer to bake the bread. Today was the second time I used this recipe, and it has yet to dissapoint anyone that has tried it, simple and absolutely delicious. So happy to hear that! Comments like yours make my day! Is there a dairy free version of it?? 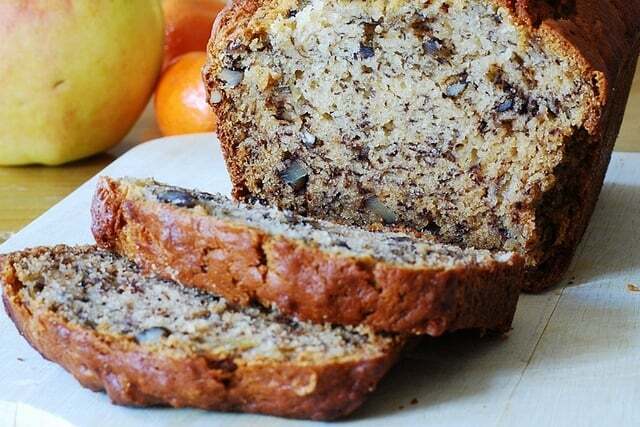 I always make this but a friend need a dairy free banana bread recipe. Thanks in advance. 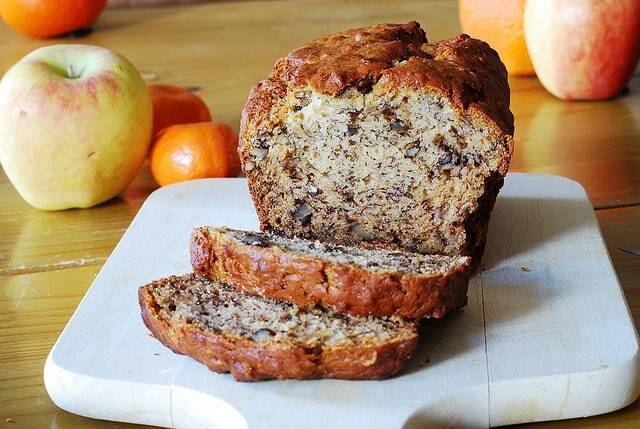 Have you tried making this banana bread GF? Delicious!!!! Super moist. I added a tbsp of cinnamon. Turned out amazing. I am very happy to hear that, Anna!